Miami Trace’s Tyrae Pettiford (4) drives around Dylan Beaugard of Wilmington during an SCOL contest at Miami Trace High School Tuesday, Jan. 24, 2017. It was a battle of SCOL-leading and undefeated in the league Miami Trace hosting the Hurricane from Wilmington High School, a team with two losses coming in of the final go-‘round of the storied, old league Tuesday night. As Miami Trace had won earlier in the season at Wilmington, so, too, was Wilmington able to pick up a victory on Miami Trace’s court, 44-40. 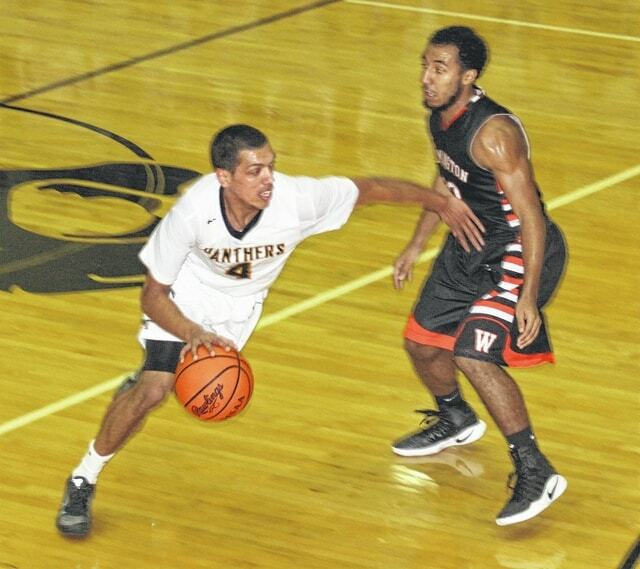 The Panthers’ two-game lead over Wilmington and Chillicothe, is now one game. Also Tuesday, Chillicothe routed McClain, 65-44. Miami Trace is now 7-1 in the SCOL, with Wilmington and Chillicothe both at 7-2. Wilmington had three players in double figures, led by sophomore Jeffrey Mansfield and junior Dylan Beaugard, each with 12 which was the high mark of the game. Junior Matt Smith had 11 points and senior Chris Wolary had seven. For the Panthers, senior Tyrae Pettiford led with 10 points. He had a slam dunk at the start of the fourth quarter. Fellow seniors Seth Leach and DeAndre Pettiford each scored six points, senior Blake Pittser had five and junior Darby Tyree had five. Miami Trace had a cool shooting night, hitting 12 field goals out of 39 attempts for 30 percent. “We didn’t have any goal of slowing the game down,” Noszka said. “It was just a question of our execution against the half-court. They do a very good job, they have good athletes. Against the 1-3-1, the biggest thing you don’t want to do is turn it over and give them transition points. For the most part, we took care of the basketball. We made them execute in the half court. Wilmington began the game with a 7-2 run. Pittser hit a three and senior Mitchell Creamer scored to tie the game. Beaugard responded and Creamer hit another shot, to bump the score up to 9-9. Beaugard had the last word with a basket to give Wilmington an 11-9 lead at the end of the first quarter. The game stayed close as the second quarter unfolded. Miami Trace was able to build a lead of six points (21-15) with 2:18 remaining in the first half. Wilmington scored the next six points, including a basket at the buzzer to tie the game, 21-21 at the intermission. The lead changed hands three times in the early stages of the third quarter. After a couple of missed shots by the Panthers, Wilmington was able to extend the lead to 30-25. The lead changed hands twice more before the end of the period that left Wilmington in front, 35-31. Tyrae Pettiford pulled the Panthers to within two with a dunk to begin the fourth quarter. The scoring went back and forth for the remainder of the game. Wilmington went up by four, 39-35, with 4:06 to play. Two free throws by junior Cameron Carter made it a two-point game with 3:31 remaining. With 1:47 to play, DeAndre Pettiford was fouled attempting a three-point shot. He went to the line and sank all three free throws to give the Panthers a 40-39 lead. Wilmington continued to be very patient on offense. After running almost 50 seconds off the clock, Wilmington turned the ball over. In just a little more than an instant, Miami Trace lost the handle and Wilmington had the ball back in its possession. Mansfield scored what would prove to be the winning bucket with 49.7 seconds remaining. He was fouled on the play and converted the charity toss to make it 42-40. Miami Trace had plenty of time and used a good bit of it to get a good look at the basket. However, the Panthers never got a shot off, instead suffering a turnover with 14.3 seconds to play. After a timeout with 10.3 seconds remaining, Beaugard scored to make the final, 44-40. “The kids are really disappointed,” Pittser said. “They had really high aspirations in terms of where they would finish with the end of season league record. As a coach, I’m pretty disappointed, because we had an opportunity to put three games of space between us and Wilmington. Miami Trace is back in action Friday with another SCOL game, this one at Hillsboro with the freshman game starting at 4:45 p.m.
MIAMI TRACE — Tyrae Pettiford 2 (1)-3-10; Seth Leach 2-2-6; DeAndre Pettiford 0 (1)-3-6; Blake Pittser 1 (1)-0-5; Darby Tyree 0 (1)-2-5; Mitchell Creamer 2-0-4; Cameron Carter 1-2-4. TOTALS — 8 (4)-12-40. Free throw shooting: 12 of 16 for 75 percent. Three-point field goals: T. Pettiford, D. Pettiford, Pittser, Tyree. Combined field goal shooting: 12 of 39 for 30 percent. Three-point field goals: 4 of 17 for 23 percent. Rebounds: 20 (4 offensive). Assists: 6. Steals: 8. Blocks: 1. Turnovers: 7. Personal fouls: 9. Bench points: 8. Second chance points: 0. Points off turnovers: 5. WILMINGTON — Jeffery Mansfield 4 (1)-1-12; Dylan Beaugard 4 (1)-1-12; Matt Smith 4 (1)-0-11; Chris Wolary 3-1-7; Curtis Gauche 1-0-2; Layne Griffith 0-0-0. TOTALS — 16 (3)-3-44. Free throw shooting: 3 of 5 for 60 percent. Three-point field goals: Mansfield, Beaugard, Smith. Combined field goal shooting: 19 of 43 for 44 percent. Three-point field goal shooting: 3 of 14 for 21 percent. Rebounds: 28 (7 offensive). Assists: 7. Steals: 1. Blocks: 1. Turnovers: 11. Personal fouls: 11. Bench points: 0. Second chance points: 12. Points off turnovers: 4.